Hey, all! I have some cool things coming your way in July as I end my quest of 365 blog posts in a row. I appreciate you for reading. 17 posts to go! Today I feature yet another thinker from the good folks over at Lion Forge. This was one of my pick-ups from Denver Comic Con. Shout out to Jill Gerber for the recommendation! 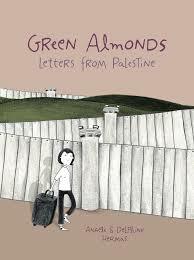 Green Almonds: Letters From Palestine is a true story that focuses on the interaction of letters from sisters Delphine and Anaele during the months of March-December of 2008. During that time, Anaele heads to live and work in Palestine while Delphine stays in Liege, Belgium. The sisters decided to create a graphic novel based on their interactions during that time…giving us Green Almonds. While the book sells itself as an interaction between the sisters, the story is fairly one-sided, as most of what we see is from Anaele’s perspective in Palestine, and we get to read a few postcards from Delphine with no real images to accompany. I guess that makes sense as much of the conflict and intrigue comes from the sister that has thrust herself into a world that is completely unfamiliar. There is a lot to be said about shaking up one’s life as much as Anaele does. The images are presented to us in a simplistic black and white with straight forward panel/page layouts. This graphic novel is about much more than the art. This book is about changing one’s world view. It’s about how different and the same our lives are across the globe from minute to minute. The older I get, the more I like to travel and experience culture. When I can’t travel, I like to turn to graphic novels, articles, or films to educate myself on other cultures, and over the past few years, there has been an influx of graphic novels set in the Middle East: a part of the world that is constantly in flux. The graphic novel is an excellent medium to turn to in order to increase your knowledge on the authors and artists that have taken to the medium to tell their stories. I’ll post a blog in the near future featuring a list of great nonfiction titles that I’ve covered that have been set, at least partially, in the Middle East. I say don’t shy away from books that feature folks that don’t seem to be like you. And encourage your students to seek out protagonists that are different from them as well. Human beings, we ain’t that different, and hopefully, when we start understanding that, some of these barriers that we keep putting up might come down.